For an even closer view, walk another several hundred feet up the paved trail to reach Benson Bridge, which spans the falls at the first tier's misty base. Standing on the bridge you have a perfect view of the top tier's full 542-foot height and a knee-wobbling vantage point over the second tier's 69-foot drop! The bridge is named for Simon Benson, a prominent Portland businessman who owned the falls in the early part of the 1900s. 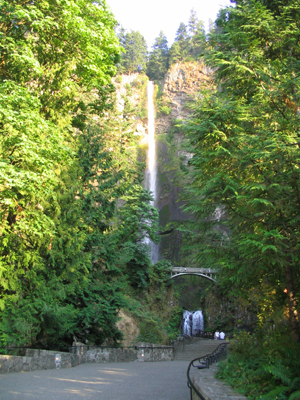 Before his death, Benson gave Multnomah Falls to the City of Portland, which later transferred ownership to the USDA Forest Service. To make the outing complete, visit the Multnomah Falls Lodge which was built in 1925 to serve throngs of tourists who came to view the spectacular sights of the Columbia Gorge. Today, the historic structure (made of every type of rock found in the gorge) houses a gift shop with plenty of postcards, a restaurant with Northwest Cuisine and unbeatable views of the falls, and a US Forest Service Information Center where you can find trail maps. During the summer months vendors offer ice cream, coffee, sodas and other quick snacks from booths and carts in front of the lodge. Unlike many of the West's famous falls, Multnomah Falls does not dry up in the late summer. Rainwater, an underground spring and snow melt feed the falls through all four seasons and ensure a spectacular sight any day of the year. - Pets are allowed at Multnomah Falls, but must be controlled and on a leash at all times. - Multnomah Falls does NOT require a Northwest Forest Pass. - Spray and mist cause a cooler micro-climate within the falls viewing area so be sure to bring a sweater in summer or coat in winter for added warmth. Follow signs just outside the lodge to hike a half of a mile to nearby Wahkeena Falls. The name Wahkeena means "most beautiful" in the Yakima language. Not as tall, at a little over 240 feet, and not as well-known, Wahkeena Falls still has much to offer in the way of beauty. The steep one-mile trail leading from the base of the falls to the top is loved by locals for its views, wildflowers, and comparative lack of visitors. From Portland take I-84 eastbound for approximately 30 miles. Follow signs and take exit 31 (an unusual left-side exit ramp) off I-84 to a parking area. Follow the path under the highway to reach the falls viewing area.